Dundee is one of Scotland’s coolest cities. Here are some of the best things to do when you’re visiting Dundee. Are you planning to visit Scotland this year? Perhaps you’ve already visited Edinburgh and Glasgow, and now you’re looking for another location for a holiday in Scotland. If so, why not take a trip to see Dundee? Dundee is Scotland’s fourth largest city, and has a well earned reputation as one of the coolest cities in Scotland. And there’s plenty to see and do while you are visiting. From historical sites to fascinating museums, and from fabulous views to delicious places to eat, here are some of the many reasons to visit Dundee. It takes around an hour and 20 minutes to reach Dundee from Glasgow or Edinburgh by rail. Trains run around every 30 minutes from Glasgow’s Queen Street Station and from Edinburgh station. Glasgow and Edinburgh are both served by flights from many UK and international airports. And you can even fly directly into Dundee from London Stansted, making Dundee a really easy destination to get to. A number of new hotels have opened in Dundee in recent years, as part of the ongoing £1billion regeneration of the Waterfront district. You’ll find plenty of hotels to suit every budget in Dundee. This includes luxury brands such as DoubleTree by Hilton, Malmaison, and Apex, as well as lower priced hotels like Travelodge and Best Western. There are also a number of well-rated guest houses, hostels and B&Bs in the city. Dundee is quite a small city and very easy to walk around and history is literally around every corner. So it’s worth just taking some time to wander around the city and soak in all of its hidden gems. When you’re planning your visit to Dundee, here are some of the top things to do. If you arrive in Dundee by rail, you’ll see Discovery Point in front of you as you leave the train station. The exhibition centre is home to the RSS Discovery, which was the ship used by Captain Scott and his crew on his first expedition to the Antarctic in 1901-1904. At Discovery Point, you’ll learn about ‘Scott of the Antarctic’ and discover the unique features of this, the first ship to be purpose built for scientific research. You’ll also find out about Scott’s first trip to the Antarctic, and of course step on board the ship itself. Entry to Discovery Point costs £11.25 for adults and £6.25 for children. You can also buy a combined ticket which also includes entry to the Verdant Works museum. These tickets cost £18.25 for adults and £10.25 for children. 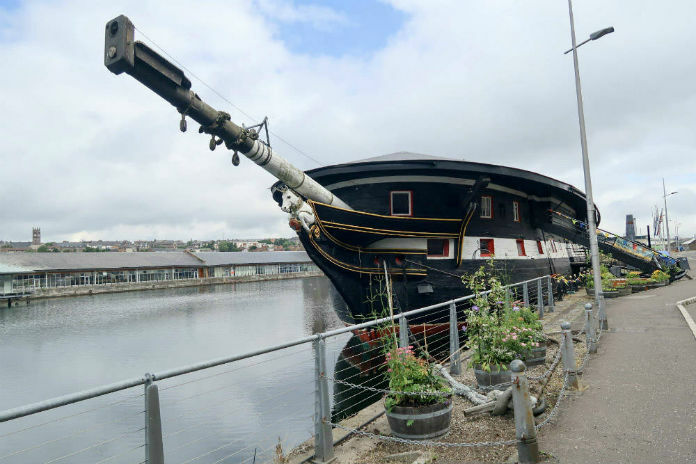 Or to see an older ship, head down to the quayside to go on board HMS Unicorn. There are only five ships older than HMS Unicorn in the world, and she originally sail in 1824. She is the last remaining warship from the age of sail, and was built in the time of re-equipment after the war against Napoleon. As such, she was not needed for immediate service, and her rigging was never installed. Instead, a roof was put over her hull and she was put in reserve. You can go on board HMS Unicorn to see for yourself what life might have been like for sailors in the Royal Navy in the 18th century. Entry for adults costs from £6.25, and guided tours can be booked. As you stroll through the city centre, you’ll come across a plaque outside St Phillip’s Cathedral marking the site of Dundee Castle. Dundee was created a royal burgh by William I of Scotland in the 13th century, but its castle was surrendered to the English in 1296. The following year, William Wallace laid siege to the castle, and the English garrison surrendered before the battle of Stirling Bridge. Control of the castle changed hands several times over the next few years, before it was ultimately destroyed by Robert the Bruce in 1313. V&A Dundee is Scotland’s first design museum and is the first Victoria and Albert outside London. The museum opened in September 2018. It is also the first in the United Kingdom that was designed by the Japanese architect Kengo Kuma. Inside this dramatic building, you’ll find around 300 exhibits from the V&A’s world famous collections as well as museums and private collections from around the world. Everything from fashion to furniture, and architecture to engineering is represented here. And a selection of exhibitions and talks focus on individual topics. The 2019 programme includes ocean liners, video games and robotics. 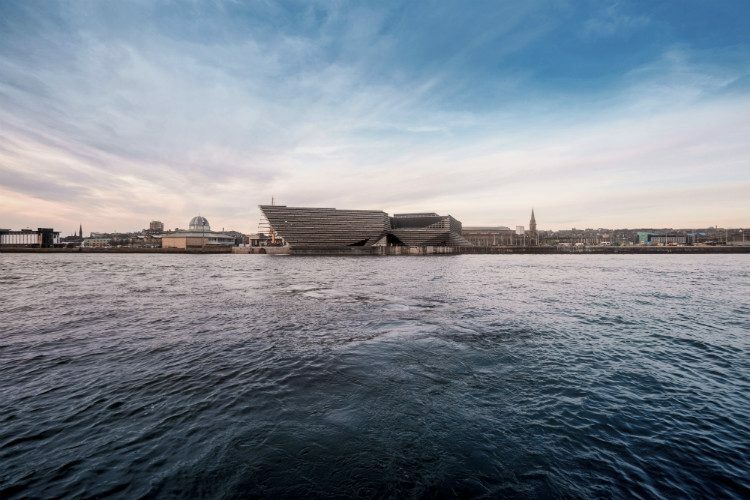 Admission to the V&A Dundee is free, with a separate charge for some exhibitions. the mcmanus is Dundee’s museum and art gallery in the centre of the city, which celebrated its 150th anniversary in 2017. It is housed in a stunning Gothic Revival style building, and has a collection of fine and decorative arts as well as a natural history collection. There are eight galleries of exhibits, including a cup-shaped steatite lamp discoverd at the Dundee Law. the mcmanus also organises a programme of events throughout the year, including fun activities for young visitors and behind the scenes tours. Verdant Works is a museum based in a beautiful refurbished Mill building. Here you can explore the heritage of Dundee’s textile industry. During your visit to Verdant Works, you’ll see and hear the mill’s machines at work, as well as listening to tales of the mill workers, and seeing how they lived and worked in the textile industry. 50,000 people worked in the industry at its height, and Dundee fulfilled most of the world’s jute requirements. You’ll also see how the workers’ families lived, and see a typical Victorian school. The museum also puts on family activities in the Red Box learning hub. Entrance to Verdant Works costs £11.25 for adults and £6.25 for children. You can also buy a combined ticket which also includes entry to the Discovery Point museum. These tickets cost £18.25 for adults and £10.25 for children. For those of us of a certain age, Dundee is full of childhood nostalgia. It’s the home of The Beano and The Dandy, as both of these comics were published by local publishers DC Thomson. So while you’re walking around the city centre, keep your eyes open for Desperate Dan and Minnie the Minx. And you may also spot a road sign for Bash Street, in honour of the Bash Street Kids. Dundee Contemporary Arts is a world class art centre, just a short walk from the railway station in the heart of Dundee. At the centre, you’ll find two contemporary art galleries, a print studio and a two screen cinema. The centre runs a packed programme of events, workshops, classes and activities for visitors of all ages. They also show films including current hits and world cinema. Click here to find out what’s on during your visit. Mills Observatory was Britain’s first purpose built public observatory. It was built in 1935, and stands on the summit of Balgay Hill in a beautiful woodland setting. The observatory has a fully computerised telescope that can detect 30,000 objects in the sky, as well as a Victorian refracting telescope, space exploration and astronomical displays and a small planetarium. Events are put on throughout the year including talks and planetarium shows. Entrance to Mills Observatory is free, with a separate fee charged for planetarium shows. During your visit to Dundee, don’t forget to take a walk up to the Dundee Law, a volcanic sill produced by a now-extinct volcano near Stiring. The Law was used as an Iron Age hillfort, and Roman pottery has been discovered there as well. The Law is around a mile from the city centre, and is quite steep if you walk straight up it. There is another pathway which takes you around the hill, for a longer but gentler ascent. And you can also drive up to the Law, free parking is provided, or even take a bus up there. Whichever way you make it up to the top of the Law, your reward will be a wonderful view out over the city, the Firth of the River Tay, and the countryside beyond. You’ll also see a memorial to the Dundonians lost in the First World War, and a topograph (compass view point) that shows the landmarks visible from the Law. Click here to read more about the Dundee Law. Camperdown Country Park is the largest public park in Dundee, covering more than 400 acres and featuring over 190 species of trees. The park is one of the most popular in Dundee, and lies around 3 miles from the city centre. It’s easy to get there by car, and buses run regularly from Dundee city centre. At the heart of Camperdown Country Park is the beautiful neo-classical Camperdown House. The house was built in 1828 and was designed by William Burn. It is currently closed to the public. Camperdown Country Park is open all year round and offers a fantastic range of activities and events. Visit the website for more information about Camperdown Country Park. After all that walking, you’ll definitely deserve to treat yourself to some of Dundee’s fine food. Scottish beef is famously excellent, and you can enjoy a wonderful Angus steak while you are visiting Dundee. You’ll find everything from fine dining at Collinson’s, to fish and chips at Murray’s a few miles up the road in Broughty Ferry. 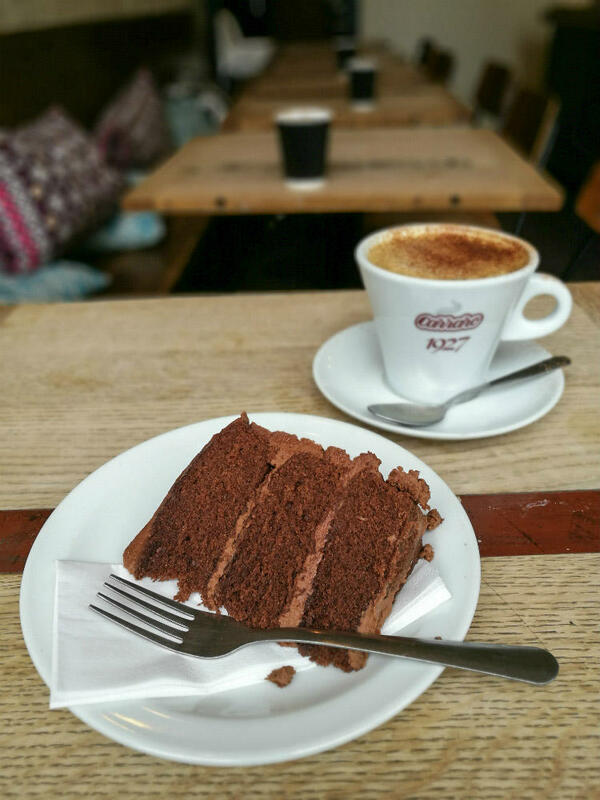 And if you feel like indulging in a sweet treat, The Parlour is always popular for coffee and a slice of cake! There’s so much to explore when you visit Dundee. It’s perfect for a long weekend, or as one stop on a longer visit to Scotland. Oh this is really useful as we have just been talking about heading up that way this summer! We havent seen any of Dundee yet but it sounds so appealing! Scotland is definitely somewhere I’d like to visit this year. I hadn’t ever considered Dundee as a destination but it definitely sounds like a fun place to visit! I had no idea there was so much to do in Dundee – that V&A building is spectacular. Beautiful. I absolutely love my trips to Scotland so I will have to add Dundee in to the list now to visit! Such a great city. You’ve made me want to see more of it for sure.